I once watched a documentary about a maximum security prison in California. 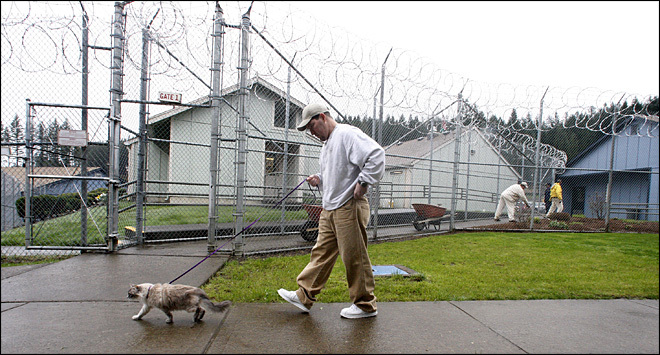 Many of the tough, older convicts took care of the cats and kittens on the prison property, often taking time to stroke them and play with them. In one scene, two prisoners, both young, musclebound gangbangers, were talking. One was a newbie, the other had been in prison for a few years. The newbie was making fun of the convicts and their "pussies," and joked about doing something to the cats. The other prisoner looked very concerned. "You don't want to do that, man! 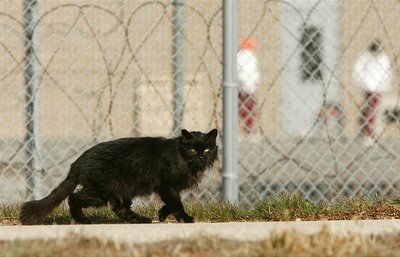 You don't want to mess with those guys' cats!," he told the newcomer, who immediately realized he was on dangerous ground. The camera than cut to some of the old-timers with their cats. These convicts were 50-plus years old, and far from big or muscular. In fact, they were wiry and lean. But if you looked at their eyes, you could see why a bigger, younger man would be scared of them and know not to mess with those cats. While playing with their cats, the cons had a light in their eyes, as if they were children again. But as soon as they said goodbye to the cats, that light went out, and all you saw was darkness. You don't want to be the one who robs a man of his only source of light.